You'll find adventure at every turn. Now, come on, quick-it's time to learn! Just like the rest of us, Groot's learning that there's a first time (and a first day!) for everything. 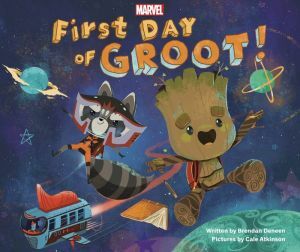 Follow Rocket and Groot as they set off across the galaxy learning new lessons, developing new skills, and making new memories with friends along the way. With so many new experiences on the horizon, Groot's sure to have a first day rooted in spectacular fun, heroics, and everything in between. Don't be late for this thrilling adventure with the mightiest heroes from Earth and beyond!